In addition to inspirational make posts and blog reflections, this week was chock-full of fun events, including a Tuesday night “Make with Me,” the celebration of Hack Your Notebook Day on Wednesday, July 10, an additional special Live Hangout on Air with Meenoo Rami Thursday morning, and a “Special Make with Me” Thursday afternoon, featuring participants from the Kean University Writing Project. Shoutouts to our fabulous panel of guests: Meenoo Rami, Kim Kiefer, Dana Cansian, MaryEllen Banfield, and Christina Cantrill (from behind the scenes). 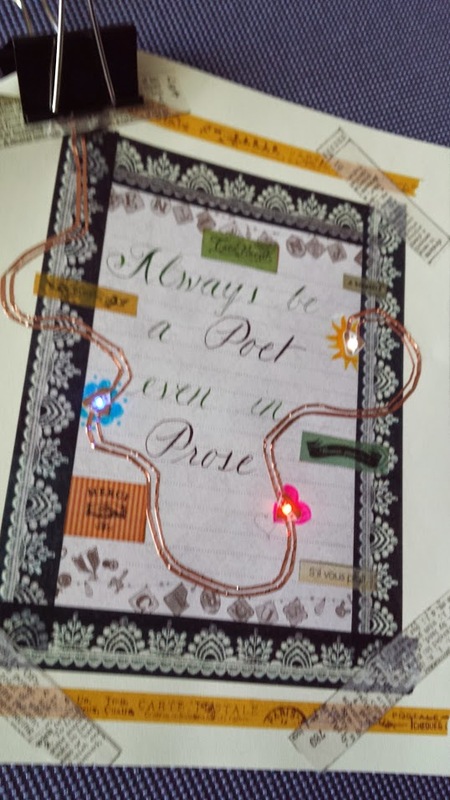 While Hack Your Notebook Day was celebrated internationally on July 9, the Kean University Writing Project lit up with the creative possibilities awaiting us in our Paper Circuitry workshop (click on the photo to the left to see more). We’re still giddy with excitement over our visit with Thrive author Meenoo Rami, who also participated in the day’s paper circuitry hack events. While she had fun making and learning with us on Wednesday, we learned from an insightful discussion with her about the power of teacher and student agency in the classroom. Creating a network of thoughtful, driven, like-minded folks in your school, district, social media communities, and beyond, learning from “the classroom teacher across the hall, or across the U.S.” is an extraordinary gift of reciprocity. Meenoo’s chat with our TCs dovetailed so nicely with the paper circuitry work the day before, and the conversation invariably continued to flow into our afternoon “Make with Me” Google Hangout. We hope that some of the inspiration we have experienced this week was also felt in our network beyond campus. Many thanks to Ian O’Byrne, Michael Wellner, and company for the “playful” Twitter chat we had on Thursday evening. There were a lot of LOLs. It is clear that the overall hacking theme seemed to draw out a little fun in us. We discussed the notion of hacking as remix with an element of ownership. We also agreed that hacking-as-revoicing text is acceptable for the purposes of innovative remix so long as attribution is taken into account. On some level, hacking has emerged as a form of mischief making. To hack is to discover ideological agendas, to revoice a text, to “mess” with an original perceived intent. And hacking can indeed be messy and even convoluted at times. But what is broken and twisted can also beautiful. Hacking can be a bearer of new knowledge. There are so many questions that have emerged collectively as we have explored writing-as-hacking together this week. When do we know when a “hack” is a successful one? Does a “hack” need to move beyond structural remix and simple translation to an identifiable new level of meaning-production in order for it to be successful? The inherent question of plagiarism, cheating, (even of plagiarizing oneself) have come up, prompting us all to think about the ethics of imitation. Is it possible to conceive of an “ethics” of hacking practices when applied to writing? In the end, “remix is conversation” (to quote Chris Lawrence from Mozilla.) The highly participatory nature of the cultural moment we live in demands a new kind of critical literacy. As educators we want to empower our students to become engaged complex thinkers. Meenoo Rami stated “I want my students to code, decode, make, break things. I want them to shape an argument, to engage civically, to be critical thinkers.” Perhaps hacking (as a methodology applied to writing) might help us get there. In this Make Cycle we have discovered together that hacking might expand an entry point for writing and writing/making for our students. For reflecting further on Make Cycle #4, we invite you to elaborate on your experiences with Hacking Your Writing this week in longer form. You can always add your thoughts on this topic in this Vialogue. 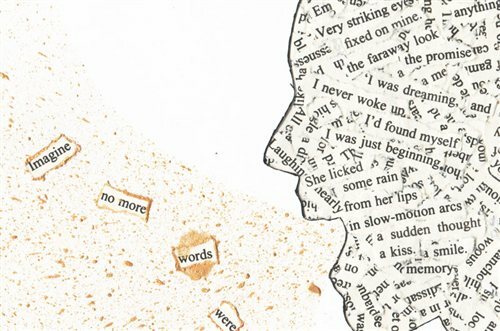 Consider a blog post to explore the idea that writing is indeed a kind of making. Or perhaps you might further reflect on the hacking-as-writing concept a bit more by trying a “Make a Case” exercise? 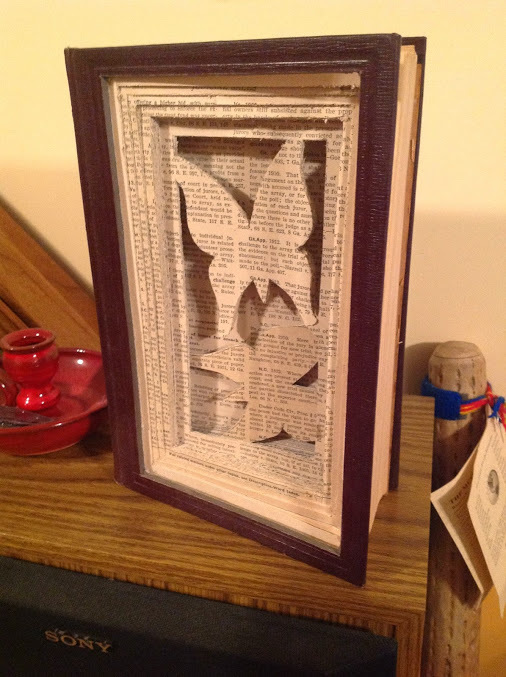 Regardless of form, we would appreciate hearing about your making processes (i.e. your successes, failures, iterations, ah-ha moments, stuck places, and everything in between). Record and share out to the community your insights about “hacking as writing”. What are your perceptions of the possible ties to Connected Learning? What ways might hacking be incorporated in your classrooms? And what influence might “hacking” play in your role as an educational leader? We look forward to what you continue to share in Make Cycle #5. (Nor is it too late to share a “How To Guide”, continue making “Memes”, tinker with “Games”, or “Hack Your Writing”). The fifth Make Cycle begins on Monday and facilitators from Maker Jawn in Philadelphia of the YOUMedia Network who will bring storytelling and further illuminations into our Connected Learning space. We’re excited to continue the call to make, learn, and play next week. Until then, keep hacking and reflecting!